When the Apple iPad released, many wondered who would be next. We knew of HP and a handful of others, but after initial reviews they didn’t pair up to the iPad. Then there were rumors of Research In Motion ordering 8.9″ display screens from Hon Hai. Many started wondering if RIM could possibly be working on a tablet. We’ve received word from a connect that RIM is in fact working on a tablet. We do not have many details at the time, but we have been told that it will be smaller and thinner than the iPad. The BlackBerry tablet also goes by the codename: ‘BlackPad’ or possibly could be what Bla1ze from CrackBerry tells us, ‘Cobalt’. The tablet will have full BlackBerry OS compatibility and functionality (note, we didn’t say what kind of OS, lol). It is not set to release this year, and going by how long RIM takes to announce anything, it wouldn’t surprise us if we don’t see the ‘BlackPad’ until WES 2011 (unless it gets leaked first). Of course you have to take our word on all of this. Remember though, we were the first to tell you about Evolved EDGE, the Pearl coming with a T9 keyboard, the power point presenter ‘black-box’, that we’d soon see a clamshell full-qwerty flip phone, and the list could continue on. The point is, we’ve presented details on things months before any other details arrive. We are confident that we’ll see more info on a BlackBerry tablet in the near future, but until then the rumors and speculations will continue. Are you interested in a BlackBerry tablet? Will you be buying one? We think if done correctly, a BlackBerry tablet could make for a very new and unique experience, one entirely new just like the slider-phone. 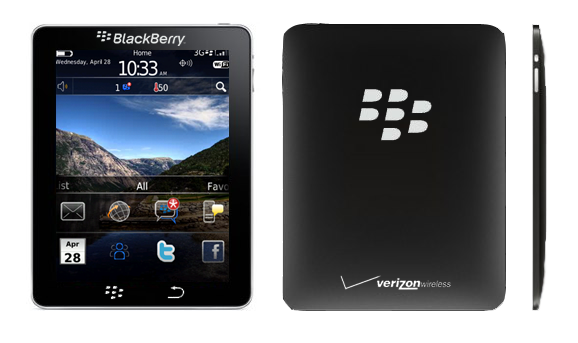 *NOTE* The image used in this article is a rendition of what a BlackBerry tablet could look like. Please do not say “Hey, that’s just an iPad with BlackBerry written on it”, because you’re right, and it’s obvious.